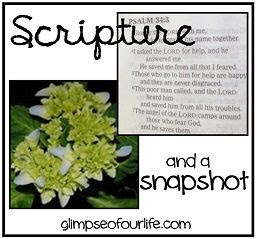 Thank you for visiting Scripture & A Snapshot. Leave a comment with a verse that God has placed on your heart this week, or leave a link to your own post sharing a Scripture and a snapshot. Please visit some of the other links, too. Oh, if we would only remember to go to Him first with our troubles instead of worrying and fretting! Jennifer, what a beautiful Psalm to start off the week. Thank You! Beautiful softly hued banner photo, so touching.